Schalk Burger has received an eight-week ban after being found guilty of gouging British & Irish Lions wing Luke Fitzgerald. And Burger's Springboks team mate Bakkies Botha is also out of the third Test at Ellis Park next Saturday after being suspended for two weeks following a dangerous charge on Lions prop Adam Jones. Both incidents happened during South Africa's thrilling 28-25 victory over the Lions in Pretoria. Burger, who won his 50th cap and led South Africa on to the field, was yellow-carded by referee Christophe Berdos just 32 seconds into the game. But match citing commissioner Steve Hinds then fingered him and Botha during the post-match 12-hour window, meaning an appearance before Canadian judicial officer Alan Hudson. Burger is suspended until late August, meaning he will also be unavailable for the Springboks' first three Tri-Nations Tests, although he could feature in the final three. The decision was announced just after 1am South Africa time, more than 13 hours after his hearing was scheduled to start. Botha, meanwhile, will be absent until mid-July, but he will be available for South Africa's Tri-Nations opener against New Zealand in Bloemfontein late next month. 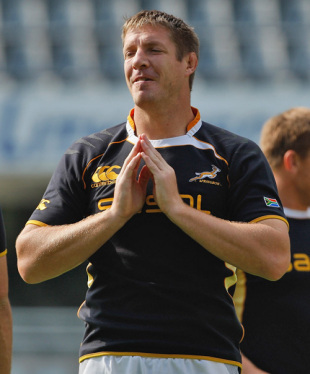 Sharks skipper Johann Muller has been called up to the squad for the third Test following Botha's ban, with Andres Bekker having been ruled out through a knee injury. Danie Rossouw is also being monitored after sustaining a concussion against the Lions, meaning that Bekker may be fast-tracked in to action for his first cap since 2007. South Africa coach Peter de Villiers has again reiterated his belief that Burger's action was not deliberate, having stated after the game that he did not believe the offence warranted even a yellow card. It is not yet known whether the Springboks will launch an appeal to the ban. "I have watched the television footage, and I am still convinced that nothing he did was on purpose," he said. "He never meant to go to anyone's eye, and we will now wait for the full report. He is an honourable man." Lions head coach Ian McGeechan earlier voiced his displeasure over Burger's actions that left Ireland Grand Slam winner Fitzgerald requiring treatment to his eye before he was able to continue. "I could never condone actions like that," said McGeechan. "I would hate to see those again. It should automatically be a red card, as I understand it." McGeechan also hit back at comments from his Springboks counterpart Peter de Villiers. "I heard a quote (from de Villiers) that it might be part of the game. To me, that is never part of the game. I am very disappointed he (de Villiers) said that. I can't see that ever being part of the game. It certainly wouldn't be part of a game I want to be associated with." Botha's challenge on Jones ended the Wales prop's afternoon - and his tour - at Loftus Versfeld. He underwent surgery on a dislocated shoulder in Pretoria. Ospreys physio Chris Towers is awaiting the prop's return to Wales before giving any timescale for his recovery. "Arrangements are being made to bring Adam home this week, and when he arrives back we will then be able to take a close look at him and assess his condition fully," he said. "We will then consult with specialists before any decision can be made regards the management of his injury and any anticipated lay-off."